Placing higher education learning and teaching as a sustainable future. HERDSA President Keynote Address, The Place of Learning and Teaching, HERDSA International Conference, Auckland, July 2013. Coming, Ready or Not: Preparing for Transnational Education. Transnational Education 2013. February 2013. Sydney. Beyond the PhD. International Consortium for Educational Development conference, July 2012, Bangkok. Connecting the dots in academic work. Presidential Address, HERDSA 2012 International Conference, Hobart Tasmania available at: http://www.herdsa.org.au/?page_id=2885. From serendipity to strategic research development. Keynote Address, Vitae Conference, Manchester England. September 2012. The Future Research Leaders Program Otago University invited address, March 2012. Research Leadership: Next Generation Training University of Auckland invited address, March 2012. Leadership development for department chairs; Addressing the needs of different faculty audiences; Directing a successful learning and teaching centre; Assessing faculty development programmes and centres. International speaker, International Institute for New Faculty Developers, POD, Atlanta, June 2011. Online Research Skills Training; Research Leadership: Next Generation Training. Research Skills Training conference, Epigeum (Imperial College, London), Birmingham, UK. February, 2011. Leading productive and constructive research communities. University of Liverpool invited address, September 2010. Raising expectations for research leadership and management. Australian Leadership in Education Summit, October 26 – 27, 2009,University of New South Wales. Profitable first class research through innovation. Strategy and Growth for Higher Education, Government and Partners, December 1 – 2, 2009, Sydney, Australia. Building productive research communities. University of Glasgow, June, 2009. ICED, Global faculty development and Chinese Higher Education; Theory, Practice and Implications: professional and organizational development for Chinese higher education in the global context; Consulting services and their importance for faculty development [panel member]; Building faculty development national organizations [panel member]. July 13 – 16, 2009, Beijing. [Chair, ICED Delegation and Invited guest of the Chinese Ministry of Education]. Strategies to engage stakeholders in major curriculum reform. Marketing Higher Education Conference, September 9 -10, 2009, Sydney, Australia. Enhancing the student experience through improved higher education leadership and practice. International Conference of the Higher Education Research and Development Society of Australasia, July 6 – 9, 2009, Darwin, Australia. Leading academic communities in tough times. Australian Financial Review Higher Education Conference, Sydney, March, 2009. Transforming education from the inside out. Australian Higher Education Congress: Transforming Education. Sydney, March, 2009. Future Research Leaders: A Case Study of collaboration Driving University Success: Higher Education Human Resources Conference, Sydney, April 2008. Research Capacity Building: A New Model for University Staff Development. 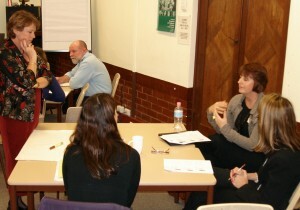 Invited Workshop, Australian Universities Quality Forum, June 2008.